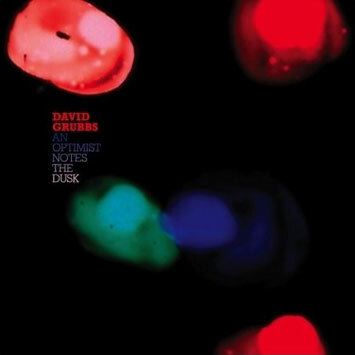 "A step into the void" is how David Grubbs describes AN OPTIMIST NOTES THE DUSK, his first solo album since 2004's A GUESS AT THE RIDDLE. Much the same way that each of Gastr del Sol's albums sought to avoid precedent and to model a world in which nothing should be taken for granted, AN OPTIMIST NOTES THE DUSK steps into the void. Nothing necessitates - it's all built from the ground up, and at each step of the way it could have been built differently. David Grubbs's previous solo albums have tended to divide cleanly between pop records (THE THICKET, THE SPECTRUM BETWEEN, RICKETS & SCURVY, and A GUESS AT THE RIDDLE) and more experimental, instrumental records that investigate solo performance, drones, and hypnotic repetition. Grubbs's pop records stand in a series of increasing refinement. Here, the cards have been shuffled (is he dealing with a full deck?). AN OPTIMIST NOTES THE DUSK presents five longish songs and one eleven-minute instrumental floor rumbler, and the album can't be said to fall into either of the previously staked camps. Much like Gastr del Sol's recordings, arrangements take their own sweet, otherworldly time to unfold, and you're likely to discover that the undertow is stronger than you reckoned, and that you wind up a disorienting distance from where you began. That describes the associative flow of individual songs and of the album as a whole. How do you get from the exquisitely unraveling song-skein of "Gethsemani Night" to the analog-synth sleeping bag of "The Not-So-Distant"? The band left the building a long time ago. Much continues to be written about the end of the album and its splintering into the MP3dom of individual songs. AN OPTIMIST NOTES THE DUSK is at one and the same time an album and a collection of splinters. There is no contradiction. Do we dare suggest that it feels very "playlist"? The electric guitar is central to AN OPTIMIST NOTES THE DUSK. In Grubbs's hands the guitar can be as languid and liquid as Loren Mazzacane Connors' ("Gethsemani Night"), as spikily anthemic as the Pretty Things ("Holy Fool Music"), or as obsessively patterned as your favorite banjo eccentric ("Eyeglasses of Kentucky"). Speaking (singing) of Kentucky, Bluegrass-native but Brooklyn-residing Grubbs seems to have lyrically reconstructed the Kentucky of his dreams, with songs about Thomas Merton's hermitage at the Abbey of Gethsemani and Lexington photographer Ralph Meatyard's trick of turning the waiting room of his Eyeglasses of Kentucky store into an exhibition space. Optometrist, optimist note the changing sky. Two sonic secret weapons have been brought in: drummer and percussionist Michael Evans and trumpeter Nate Wooley, both of whom ride musical divides like they've never heard of such divisions. It's all in making the right sound at the right time, what could be easier?